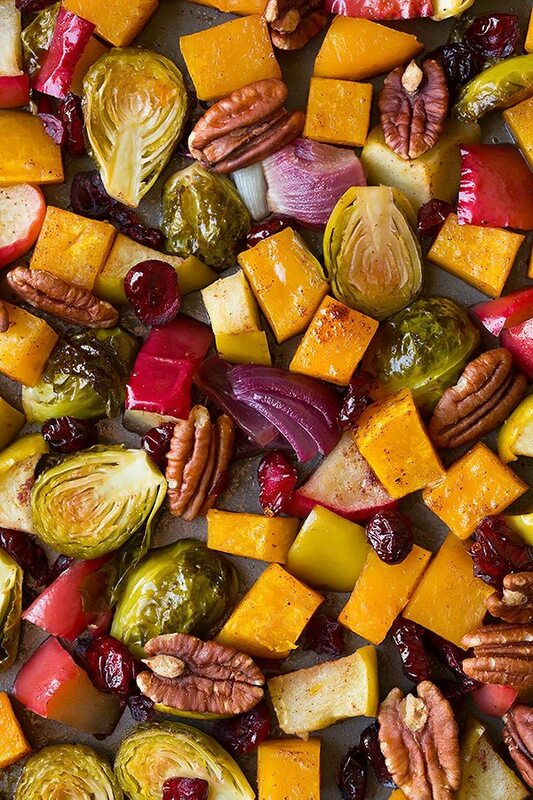 Not only do these Autumn Roasted Vegetables and Apples look nicely colorful but they taste amazing! I just can’t get enough of this blend of flavors, colors and textures here. It includes Brussels sprouts, butternut squash, red onion, apples. I was actually pretty skeptical when I was throwing this all together, I thought it would either be a total flop or a delicious success. Well, I’m happy to say it was definitely the latter. We could not get over how good this was! It may seem like a strange combo with the spices, brown sugar and onions and brussels sprouts but it just works and it tastes heavenly (not often I’ll say that about veggies)! It will definitely be one of my new go to fall side dishes. 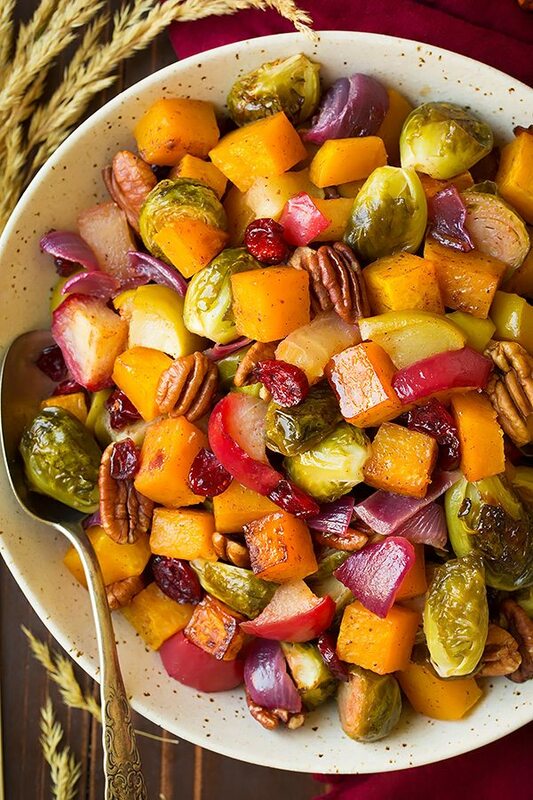 And for the record I know squash is technically a fruit but it just sounded awkward to call this “autumn roasted fruits and veggies,” don’t you think? Maybe that’s just me and thinking too much of it. 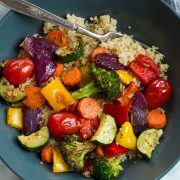 This flavorful roasted vegetable and fruit blend will most definitely be the highlight of any meal. It’s a new staple recipe in my book and it’s sure to be a crowd pleaser. 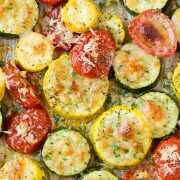 There’s just so much goodness packed into one sheet pan and you’ll love every bite! What Should I Serve with This? 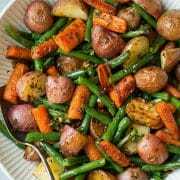 The perfect fall side dish! 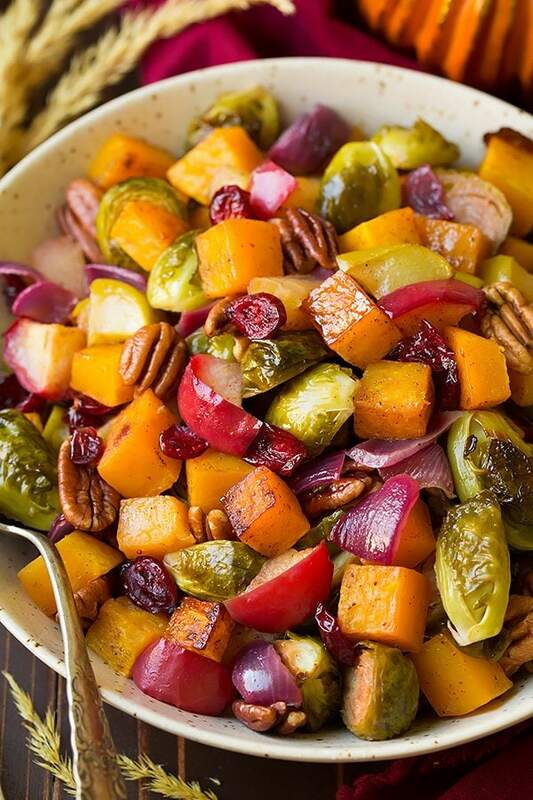 This seasonal, colorful roasted veggie blend includes Brussels sprouts, red onion, butternut squash, apples. It's seasoned with spices and lemon and you'll love the addition of crunch pecans and chew cranberries. Such a tasty recipe! Add Brussels sprouts and red onions to a large mixing bowl. Pour 2 Tbsp butter over top as well as 1 Tbsp lemon juice, toss while seasoning with salt to taste (about 1/4 tsp). Transfer to baking sheet and spread out across pan. Add squash and apples to same mixing bowl. Pour remaining 2 Tbsp butter over top and toss, then sprinkle brown sugar, cinnamon, nutmeg and salt (about 1/4 tsp) over top and toss to evenly coat. Transfer to baking sheet and spread into an even layer (just around Brussels sprouts and onions). Roast in preheated oven, tossing once halfway through baking, until Brussels sprouts have browned slightly and squash is soft, while sprinkling pecans and cranberries over top during the last 3 minutes of baking, about 40 minutes total. Serve warm. *I recommend using one sweet and one tart apple. I used one Tango apple and one Granny Smith apple. Honey Crisp, Braeburn, Cortland, Jonathan or Rome Beauty should work here as well, but keep in mind they won't have that same rosey color. Dar: I’ve made this with sweet potato vs squash and olive oil vs butter and it is so good. I will add kilbasa to it sometimes too. This is a versatile dish! We are having it for Thanksgiving!